The smartphone features a 2100 mAh Li-Ion battery (1650 mAh in Galaxy S2). The manufacturer claims up to 9.5 hours of talktime and 290 hours on standby. 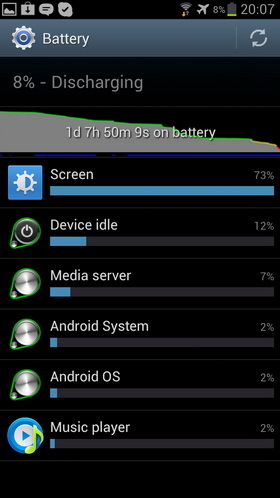 In real life the phone lasts around one full day with the workload compared to that of Galaxy Nexus and you clearly see the advantage over Galaxy S2 if you tweak the energy consumption settings, which are offered in abundance. 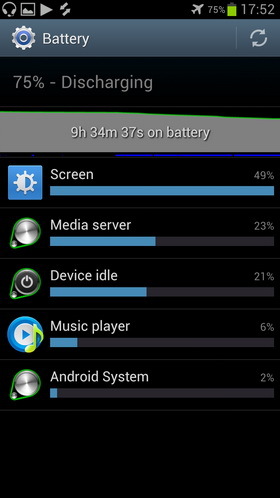 At the time of its launch Galaxy S3 is the most energy efficient Android smartphone available. Let's start with standard settings, for example the inbuilt energy saving app. It allows limiting the processor speed, set energy saving for the screen, give up vibro when touching the screen or select a black background for the mail software or a gray one for the browser, which is quite handy for an AMOLED screen. 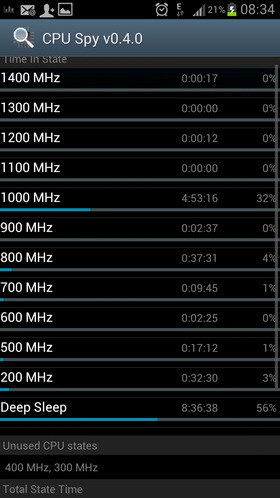 To my mind capping the processor speed is a useful approach as it gives you a 10% boost in the operation time. At the same time you will not suffer from the sluggishness of the overall performance. I never experienced an instance when the processor made the apps run slow. The performance difference can be easily accounted for by any test, let's say Quadrant Standard. With the cap on I had 4237 points instead of 5278 in the unrestricted mode. A 23% difference is rather considerable, but synthetic tests do not show the real life performance. It is virtually impossible to tell the difference in the browser operation (I used the stopwatch, but could not record any change of note) as the speed is determined by the connection capabilities rather than the handling of a particular web page. Having looked at the processor use in various circumstances we can claim that 1.4 GHz is employed in web surfing, while the majority of heavy apps (for example, working with video) rely on 1 GHz. As far as the speed difference is negligible it is worth capping the processor speed. 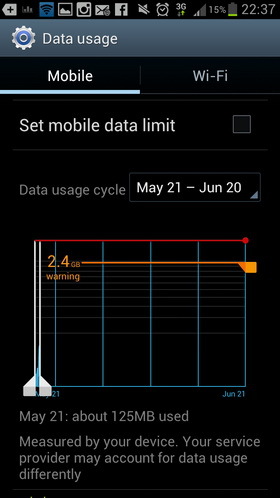 Bear it in mind that if necessary the phone will bypass your speed cap as it happened to me once. It is not convenient for me to choose the black background in the mail app, because I favor white background and black fonts, so I did not go for such an energy saving technique. 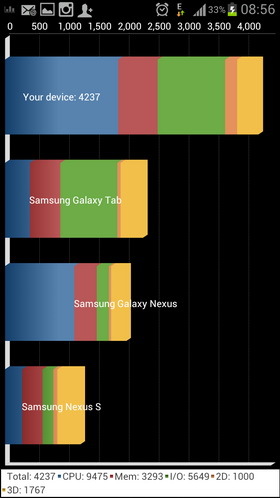 The main question was how much longer would the current flagship operate in comparison with Galaxy S2. In my case the latter was good enough for half of the day as I stay online a lot and receive many push alerts. 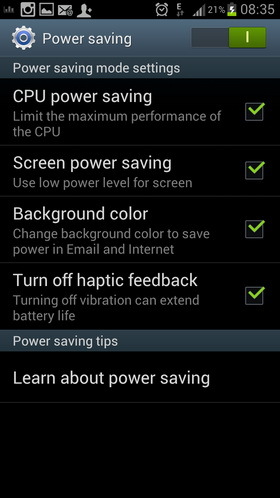 With Galaxy S3 I can be safe for the entire day and the battery is not completely dead when the sun gets down. Interestingly that I do not have to make tough choices with Galaxy S3 and can do whatever I want: watch video, listen to music, surf the web and so on. The weak point is the screen, which consumes a lot of energy. Look at the next two pieces of data highlighting the influence of the screen on the energy consumption (flight mode was used in both experiments). We see that the music playback takes much less power than handling the video. 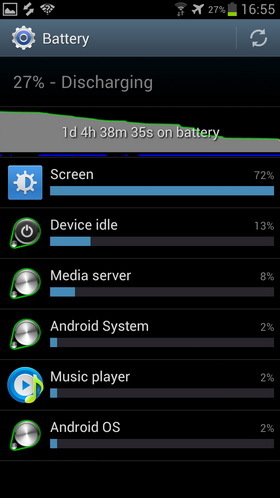 To put it into the perspective in HTC One X video playback lasts for 4.5 hours with maximum brightness and 5.5 hours with 30%. 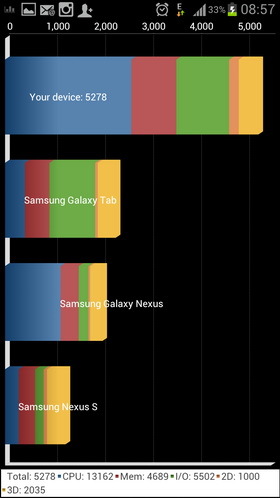 I think it is a huge lead of Galaxy S3 in this department. The only Android rival for Galaxy S3 here is Motorola Droid Razr Maxx, which is explained exclusively by a huge 3300 mAh battery. 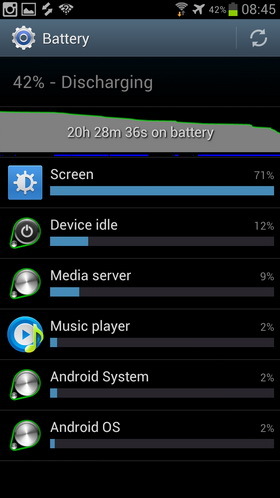 It is necessary to mention that the battery makes Razr Maxx heavier, while its screen is inferior to that of Galaxy S3, where the improvement is achieved courtesy of software settings and engineering know-how. It is the first model featuring a 32 nm processor resulting in lower energy consumption. Another special approach from Samsung is the use of one processor core on a lower speed to decrease the energy consumption during standard procedures like checking mail in the background mode, music playback, etc. For example, Tegra3 has a separate processor with the capped speed for that as Nvidia comes up with 4+1 scheme (four cores of the main processor plus one more). Despite the considerable Nvidia expertise in the field Samsung managed to achieve the same with the standard quad core processor. The trick is in the fact that the Korean manufacturer developed not only the processor, but other phone components too with the energy saving as the principal target. Calls – 1 hour 20 minutes; browser – 30 minutes; Twitter and other social networks – 1 hour; music (FM radio or audio files) – 1.5 hours; mail – around 300 messages; camera – 20 photos resulting in the overall operation time of 18 hours. Calls – 1 hour 20 minutes; browser – 30 minutes; Twitter and other social networks – 1 hour; video – 2.5 hours; mail – around 300 messages; camera – 20 photos resulting in the overall operation time of 12 hours. 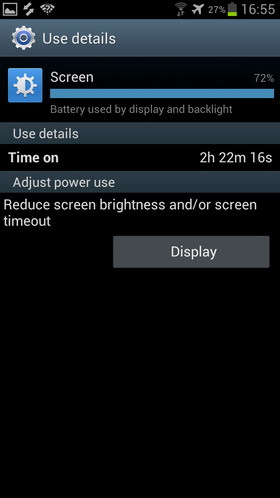 The full charging of the battery requires 3 hours. In gaming apps the phone can last between 4 and 6 hours depending on the game requirements, selected settings and whether you employ headphones or the inbuilt speakers. By comparing our model with HTC One X we get a double advantage for the Samsung Android wizard. 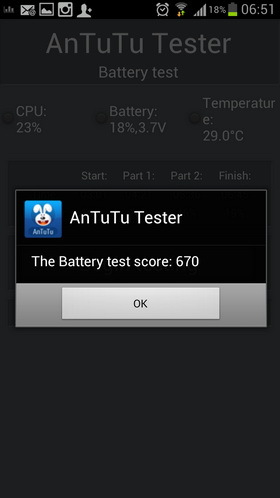 To crown it all look at the screen shot of a AnTuTu Benchmark test. 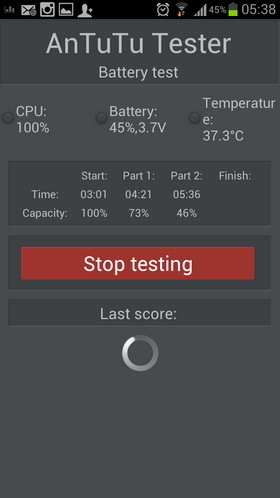 Once again it is a synthetic test, which does not reflect real life performance, but can be handy to compare Galaxy S3 with the previous incarnation. For the first time an Android smartphone managed to bridge the gap with Apple iPhone, which lasts the same amount of time in comparable conditions. The legendary iPhone still comes on top, but the advantage is merely 10-15%. We should also remember that Apple iPhone has a smaller screen. 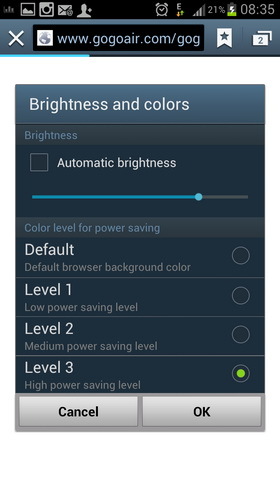 In other words among Android offerings Galaxy S3 beats any rival in terms of energy saving. 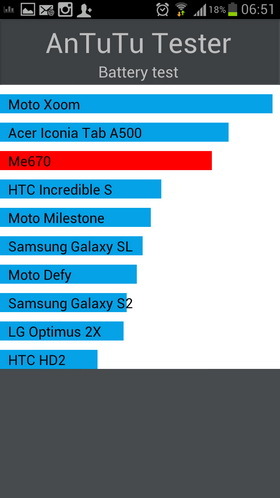 For the first time an Android flagship can give you decent operation time and you don't have to worry about it. 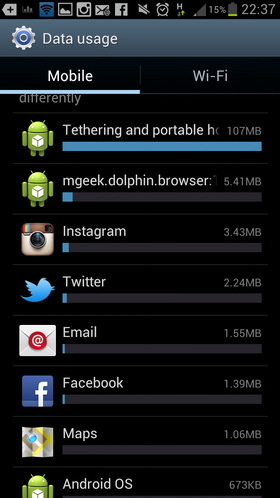 Even if you are trying to get the most out of your device Galaxy S3 will not leave you disappointed. As to the downsides we found out that some third-party apps can influence the energy consumption negatively. For example, the Dice video player, while supports the same codecs needs more energy and the same applies to many music players. Try to go for balance when choosing between features and operation time. To finish on a positive note it is nice not only to select displaying the battery level in the status bar, but to show the charge in percentage points too.